Cricket, the most English of sporting pastimes. 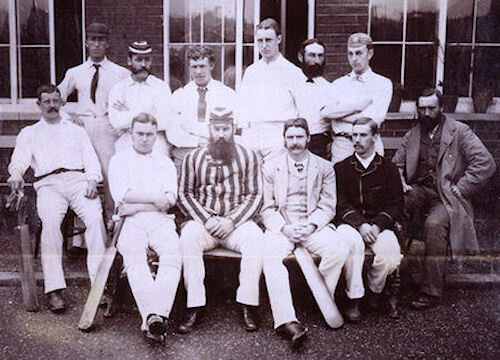 Ah, the summer sights and sounds of leather thwacked by willow, the guffaws of Brian Johnston in the distance, snoozing spectators, W. G. Grace's beard flapping in the breeze, umpires piled with sweaters and grass stains on white flannel. Grass stains are what you want to avoid on these beautiful Cricket White Fox Flannel trousers from dear Fox Brothers. They are made bespoke and measurements can be taken in London or Fox's Somerset base. Or you can provide your own. They are available in 10oz or 13oz flannel. As you may recall, we first spoke about this desirable flannel in Navigating the English Flannel. And now we see it as God intended, the cloth of gentlemen in trouser form. Navy blue flannel blazer next? I maintain that polyester on the pitch just isn't cricket. After donning polyester it's a small step to ball tampering and match fixing, mark my words. >>> Previous on Fox Brothers.